The Original JPTACTICAL Pet Carrier offers pet owners everything they will ever need to keep their furry friend safe, comfortable, and happy during travel. HOW DOES MY CARRIER KEEP MY PET SAFE? Our unique zipper locking clips on our pet carrier are designed to prevent curious pets from opening the carrier duirng travel to ensure your pet stays safe and secure at all times. Carrier also features an internal leash for added protection. Our heavy duty design is made to withstand even the sharpest claws of your dog or cat. The mesh allows maximym airflow to make sure your dog or cat doesn't get too antsy, and the bottom pad is removable, just in case your pet has any "accidents." IS MY PET CARRIER AIRLINE APPROVED? Yes. We've designed our pet carrier to fit comfortably under airline seats and meet TSA requirements. Our carrier is ideal for small dogs up to 15 lbs. However as rules do change, we recommend checking with your specific airline carrier before travel to ensure you are compliant. You and your pet both need some loving while traveling! That's why we've added an extra, smaller zipper on the side in case you miss your pal and need a quick pat, to calm either of you down! THE BEST PET CARRIER YOU WILL EVER OWN! Keep your furry friend safe, comfortable, and happy in the JPTACTICAL Pet Carrier. Features include: 4 soft mesh doors for better air circulation (including top load option), all zippered exits have safety clips, internal leash, front storage pocket, adjustable padded comfort strap with pass through, and rotating metal hooks to keep your strap tangle-free. PLUS, a soft, removable, washable Sherpa insert with firm bottom to keep your pet stable and snug. AIRLINE APPROVED PET CARRIER: Generous 11.4" x 7.87 x 20.07" size fits comfortably under seat and meets airline and TSA requirements. Our canvas pet carriers for small animals are certified compliant with all airline carry-on luggage regulations for your air travel convenience, fitting under any airplane seat. 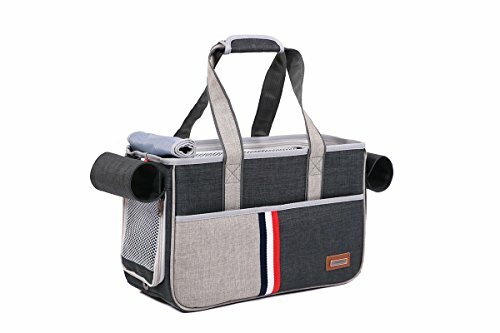 It's a great cat carrier that's perfect for small dogs, too! Cute, stylish, fashionable, they look like designer Pets handbags - only with a puppy or kitten inside! If you have any questions about this product by JPTACTICAL, contact us by completing and submitting the form below. If you are looking for a specif part number, please include it with your message.